INCHEON -- Cherry blossoms were in full bloom and songs to usher in spring resonated along a tree-lined pathway on the grounds of SK Incheon Petrochem, in stark contrast to the industrious gray structures in the background. Couples pushing strollers and bigger family clusters strolled leisurely, snapping pictures and gazing at trees, enjoying the six-day flower festival at the firm’s headquarters last week. 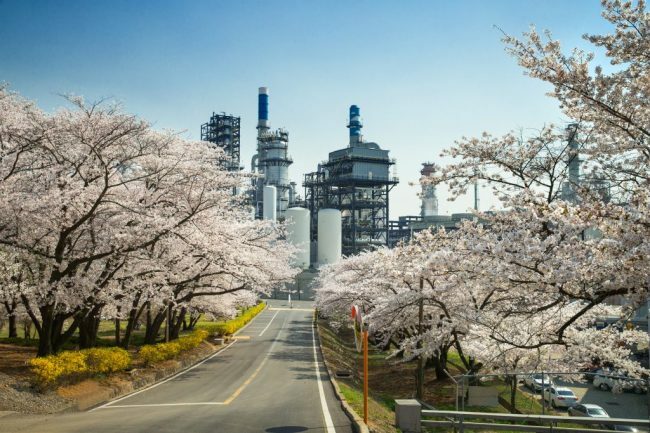 Behind that peaceful scene were the company’s desperate efforts to get along with its neighbors, who have long protested the petrochemical complex as a potential safety and environmental hazard. Just a day before the festival began, on April 8, flames and black smoke rose above the petrochemical facility. The incident, which occurred when workers fixed an abnormal gas compressor at the factory, caused acrid smoke to fill the air for about 10 minutes, resulting in a visit from the fire department. Alarming incidents had happened before. In 2013, a leak in the naphtha storage tank had caused bad odors and terrible noises when SK Incheon built additional factories on the site. Angry residents have held protests for years, demanding that the firm relocate entirely -- preferably to an industrial district such as Ulsan or Yeosu, where its rivals Hanwha Chemical and Kumho Petrochemical operate. “The existence of the petrochemical complex itself creates anxiety because no one knows when an accident might happen,” said a mother of two who has lived in Incheon since 2004. The school her children attend is right behind the petrochemical complex. The energy and chemical company, which started as Kyung-in Energy Development in 1969 and merged into SK Energy in 2008, was renamed SK Incheon Petrochem in 2013. Now it is producing petroleum products and aromatics-related chemicals in the complex. Although incidents like these are common in factories, what makes SK Incheon stand out is its location. While its rivals are located far from residential areas, SK Incheon is surrounded by apartment buildings and schools. When SK Incheon’s factory was first built in 1969, the city had more plants and fewer residential spaces. But factories moved away and families moved in, so the factory now stands awkwardly in the middle of a residential area. Faced with constant protests and concerns, SK Incheon prioritizes efforts to make the residents feel safer. “We have had some conflicts with the residents (nearby) in the process of adding facilities. The top priority of our investment is to build trust with the residents,” said Hong Uk-pyo of SK Incheon Petrochem’s corporate value innovation division during a press tour last week. SK Incheon said it was the first South Korean company to improve workplace safety by giving its partner firms the right to halt operations immediately, at their discretion, if an employee reports a risky situation. Since the adoption of this policy in July of last year, operations have been suspended on more than 20 occasions. 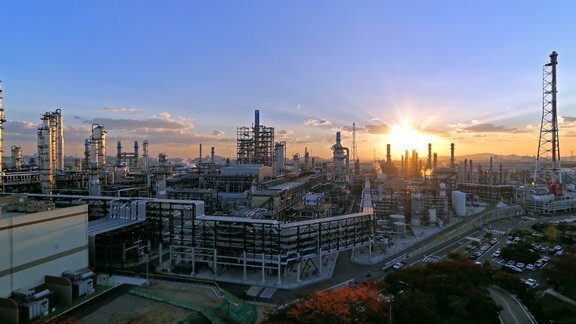 “They are not disadvantaged in any circumstance even if they do stop operations,” said Shin In-cheol, chief of SK Incheon Petrochem’s facility management team. As for the citizens, the company has hosted the flower festival every April since 1985, opening up to the public the 1.5-kilometer-long pathway lined with some 600 cherry trees. The spring festival is just one of a slew of corporate social responsibility projects conducted by the firm year-round. The energy and chemical firm also signed an agreement in 2016 with a representative of the local residents’ association to provide 31 billion won ($27 million) to finance improvements to the neighborhood’s environment as well as projects to benefit the residents’ education, safety and welfare. SK Incheon is among many other Korean companies that face challenges from local residents who object to facilities they consider potentially dangerous or disadvantageous to their neighborhoods. Most recently, local telecom companies faced setbacks in the process of commercializing the long-awaited fifth-generation network. To develop the 5G network, the number of base stations needs to be more than three times that found in the conventional long-term evolution network. This is because the frequency used for the 5G network requires straighter pathways and does not travel as well through obstacles. But installation of base stations is proceeding slowly as some residents near the installation points oppose it. Despite the facilities being approved by the state for safety, some people remain concerned about exposure to electromagnetic waves. Another typical target of heavy residential backlash is solar panel projects. Under the Moon Jae-in government, the push for renewable energy has been strong. But it also faces strong challenges from residents near the designated sites, who say solar panels compromise their quality of life and only benefit power companies. As an alternative, the Korea Southern Power Co., a subsidiary of the Korea Electric Power Corporation, issued a three-year bond of 520 million won for 14 residents living in Wondeok-eup, Gangwon Province, in November last year. The funds are to be used by the residents, who will directly take part in building a 10-megawatt solar power facility in the area. It is the first renewable energy project to be financed by local residents. The resolution was deemed to be an advanced way of compensating residents, compared with simply providing cash, as it encourages their participation in the renewable projects as well as financially benefiting them. The annual interest rate of the bond stood at 6 percent.